​Stopping Sock Dramas and Sweaty Feet. Oh the Sock Drama. Apparently The Boy's socks are now completely unsatisfactory. The seam by the toe, hereafter known as ‘The Bobble’, is causing enough irritation allegedly to warrant the removal of the socks at any given opportunity including in the school cloakroom and at any point in time when we are running late. I had a brief google about seam free socks and came across a link from The Sock Shop. This took me to a section on bamboo socks. Bamboo socks? What are these? I have always tried to get socks with a high cotton content for The Boy as he seems to get very sweaty feet. The blurb about the bamboo socks says that as a natural fibre, they keep your feet warm in the winter and cool in the summer and offer better ventilation and moisture wicking than other socks, so good for preventing sweaty feet and are naturally antibacterial and hypoallergenic. I ordered a few pairs to test them out and I have to say that they have been great. I am now officially a Bamboo Sock convert. They seem very comfortable - there has been no complaint whatsoever about an irritating 'bobble' in his socks and his socks definitely seem much drier after being in his shoes all day. 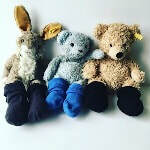 Don’t panic if they come out of the washing machine looking like they are socks for teddies – they seem to stretch back into shape quite easily. It says on the washing instructions not to tumble dry them, but as I seem to be incapable of following washing instructions, I have obviously tumble dried some, but they still lived to see another day. “A burn takes a minute to occur and a lifetime to heal if treated incorrectly”...A few years ago I scalded my leg very badly after knocking a boiling pot of coffee over it. Rifling through the medicine box trying to find anything that might help I came across some burn gel and a hydrogel burn dressing. We must have had it in a travel kit or something as I don’t recall buying it. Well, this saved me. It was like miracle medicine. The gel was very soothing and the burn dressing is a spongy texture, also soaked in gel which is designed to cool the skin. The gel went on and within a few minutes the pain was subsiding. I went to the doctors the next day and got some special sterile dressings. I have been very lucky, my skin is slightly discoloured in that area but it is not too noticeable and I get the odd twinge but otherwise there is no pain or sensitivity. I put it all down to having that burn dressing to hand. When I knocked the coffee pot over, The Boy was standing right next to me. At the time, his head was at the same height as the worktop. If the coffee had gone 2 inches to the right it would have gone all over his face. This thought still fills me with horror. I ensure now that I always have a burn kit within reach...We are going camping in a few weeks and I have ordered more gel and dressings to keep in my camping gear. With naked flames, boiling water and barbecues at head height all over the place and scant access to medical services, I feel this is a very important safety precaution. The burn kit I use is Burnshield – the gel sachets and the 10 x 10 dressings. 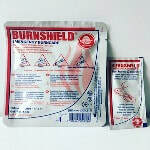 Burnshield is the brand that is used by St John’s Ambulance. If you have nothing much else in your medicine kit, make sure you have this! Don’t forget bandages, scissors and tape! 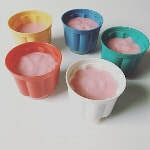 ​I am on a mission to crack the blancmange challenge – the challenge of making some blancmange and actually managing to get it out of the mould without it looking like someone has taken a big spoon and mushed it all up. I have tried a plastic cat mould and a silicon mould but they were no good. Last chance before I give up are these mini moulds. These looked quite good I thought and the benefits are that you can keep them individually sealed so you can keep them in the fridge for a while and they are already in handy portions. The question was, will they actually come out in one piece or will we have to eat it straight from the pot (not that bad a prospect anyway...). Well, I am pleased to say we have blancmange success! This has also now inspired me to try other types of pudding...crème caramel and custardy type chocolatey and vanilla puddings. Yum Yum Yum. They obviously lend themselves to all kinds of fun making differing types and colours of jellies and the blurb says they are also good for mousses and ice-cream. 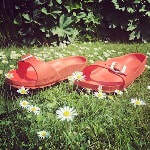 The Child is very excited and wants to make a rainbow jellies, They will certainly keep us busy anyway! I believe they are also available in Lakeland and similar kitchen shops. This stainless steel dog water bottle is my favourite purchase of last week. I got this for The Dog for when we are on longer walks and bike rides when she needs some liquid refreshment en route. The Dog is quite fussy when it comes to drinking her water. She won’t drink out of any rubber bowls – I only discovered this after one of our earlier trips to the beach when I had purchased a collapsible rubber dog bowl, thinking that was a good solution as it would fold nice and flat in my bag. Well, she totally refused to drink any water from it and it was a warm day so I ended up having to use my hands as a bowl for her which was fine in theory but then she slobbered in my hands which made it no longer fine. The lid of this water bottle screws off and this is what you use as the bowl – I was a bit concerned we might have similar rubber bowl issues again, but she took to it fine, so this is great news. 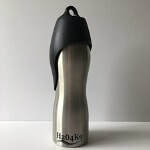 It fits easily in a rucksack, it doesn’t leak and it is stainless steel so no BPAs or funny plastic tasting water. You can also get a neoprene carrier to fit this, which I haven’t tried yet but they look quite handy if you don’t want to carry a rucksack. And I love the name – although it did take a little while for me to figure it out! The Boy is learning to tell the time at school. He had ‘telling the time’ homework this weekend which we worked through with some tears and tantrums (largely from me) but we got there in the end. This watch has been most useful in timing things - what time school ends, how long he can watch the Ipad for etc. This watch is great as the hands are different colours so you can easily see the difference between the small hand and big hand. 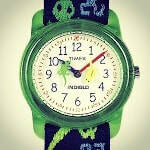 The strap is a comfy stretchy strap and his watch is fun to look at as it has geckos rotating around the face. It also lights up with a blue light when you press the button. I know this as it was very close to my eyeball when he woke me at 3 this morning telling me it was 3 o’ clock. He has tootled off to school this morning quite happy and feeling very manly because he was wearing his watch. ​We have just come back from a week’s holiday in Wales. Feeling a touch guilty about the prospect of parking The Boy in front of the Ipad of an evening, we decided to take a board games along. We took Monopoly Junior. 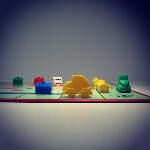 Monopoly Junior is a good place to start with family board games. The board is half the size of a regular Monopoly board so in theory this should make the game faster moving. This Monopoly follows the same principal as regular Monopoly - the person who runs out of money first loses and the person with the most money at the end is the winner. There are good lessons to be learnt - The Boy, was The Banker which worked out particularly well as this introduced stealth maths practice. He had to count out all the money and add and subtract the notes for the right amounts and over the week we could see how he was getting more proficient at this. Much fun was had by us all with the added bonus of having educational elements. So my summer of fun was under threat. The wasps...previous stings has resulted in wasp fear from the Boy. Any wasp that approached caused an instant desire to go inside. This is where my Summer Of Fun - enjoying the warm weather and being outside and BBQ joy was in jeopardy...I remembered however about something I purchased last year but never got around to using. It was a Waspinator - a material bag which you basically hang up and it is supposed to mimic a waps's nest and therefore deter wasps from the area. 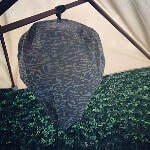 I put it up under the brolly in the garden and a few hours in, there definitely seemed to be less wasp action. 24 hours in and it was still looking promising. The tester was breakfast. The previous day, without a Waspinator, we had bacon and eggs and there was enough wasp activity to make eating outside not a good experience. This morning, with the Waspinator in situ, we tried again. There was some wasp investigation but they flew off again. I also placed an offering of some apple juice on a table a little bit away from us and the wasps seems to head straight for that. So I think it does help to deter the wasps and is effective when coupled with something else to lure them elsewhere. It did a very good job of instilling some confidence again into The Boy to be able to sit outside stress-free, so that works for me!